Why should out-of-date, unwanted books molder away in the dark corners of libraries, or – far worse – in a landfill? 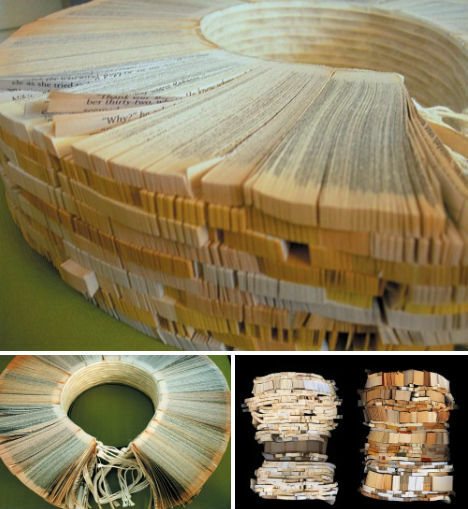 Artists working with books, whether they make it their sole chosen medium or just experiment once in a while, rescue these bound volumes of art and information and fold, cut, carve, glue, assemble or otherwise transform them into amazing sculptures and installations that honor or often transcend the meaning held within the pages. 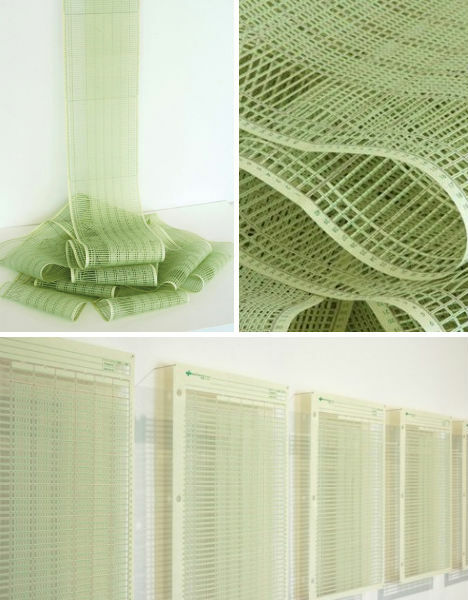 Jill Sylvia meticulously removes the blank entry blocks in ledger books and balance sheets, leaving behind nothing but delicate paper mesh. 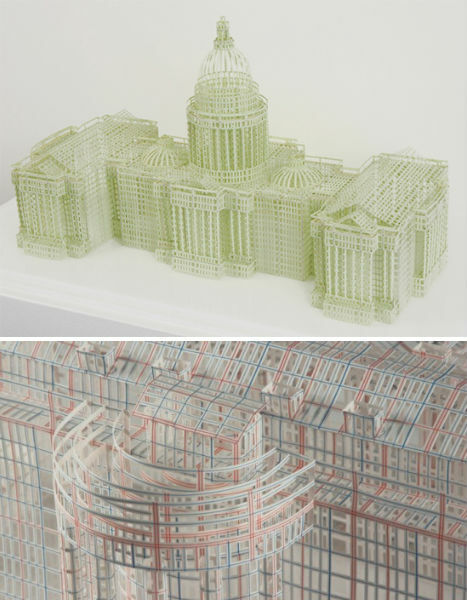 These geometric skeletons are then used to build amazing replicas of famous buildings like the U.S. Capitol and the White House. 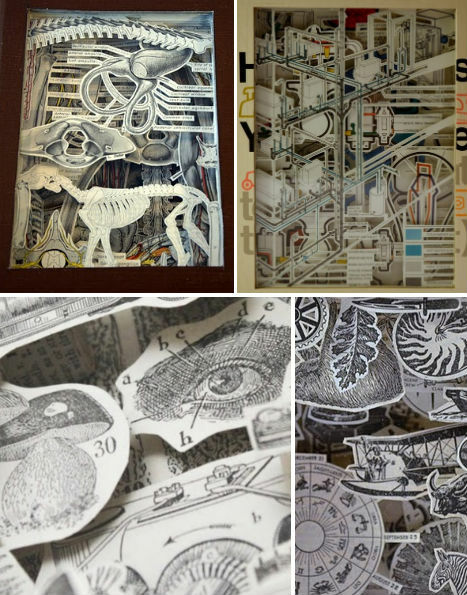 Favoring anatomy books, wildlife guides and instruction manuals, artist Julia Feld selectively removes parts of pages to leave behind layered collages, often left within the hardcover to resemble shadow boxes. 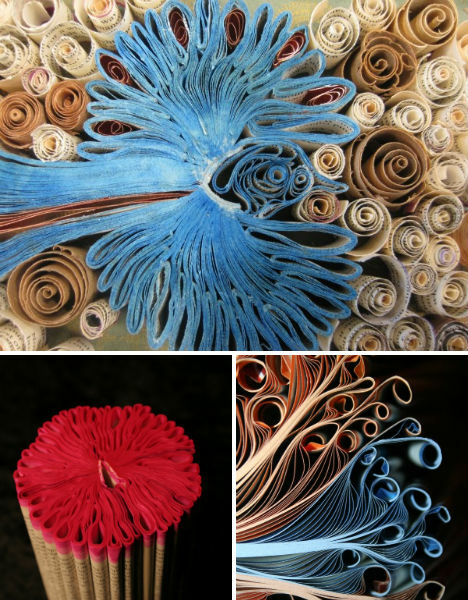 She sells these intricate works at her Etsy shop, Holy Stokes. 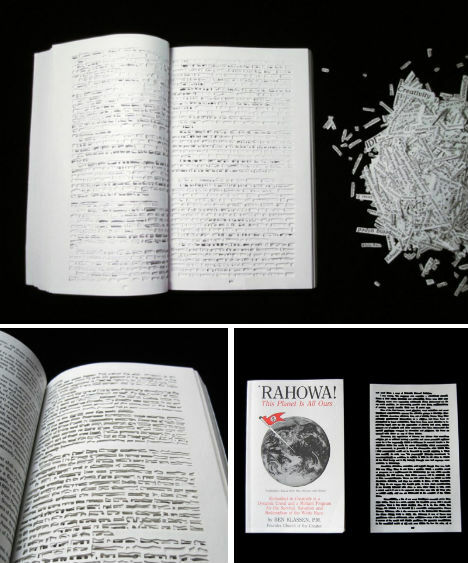 In her series ‘Between the Lines’, artist Ariana Boussard-Reifel has cut each and every word out of the pages of books, leaving behind only the white space, creating patterns that render the books meaningless – or do they? Traumgedanken (Thoughts on Dreams) is a 76-page collection of literary, philosophical, psychological and scientific texts which provide insight into dream theories. 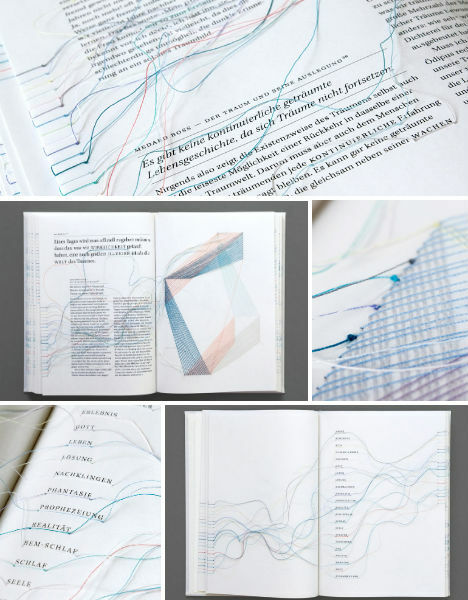 Amazingly, German artist Maria Fischer has hand-sewn the pages with threads that tie images to certain keywords as sort of physical hyperlinks, which, Fischer says, visualize the confusion and fragility of dreams. 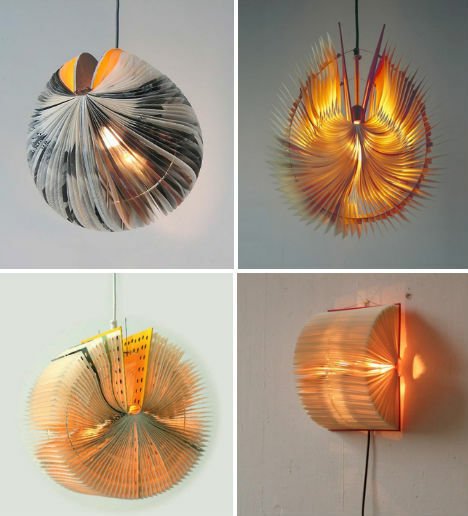 Designer Michael Bom turns books of all sorts into stunningly artistic lamps that retain the character of the book’s content. 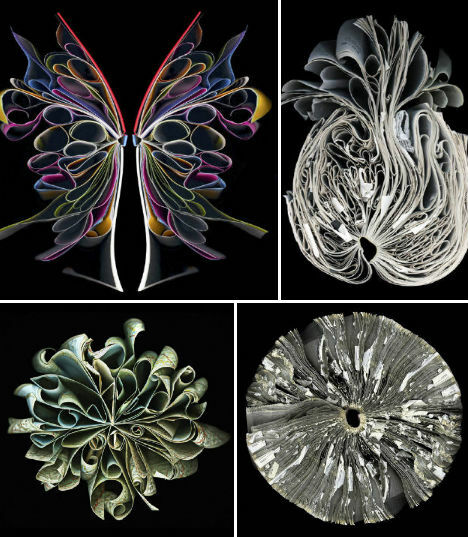 Some are simply opened, with the pages carefully spaced apart, to act as wall lamps; others are carefully cut and crafted to provide a variety of shapes. Between the pages a viewer can just barely glimpse images and text, which create interesting patterns of dark and light on the lantern surface. 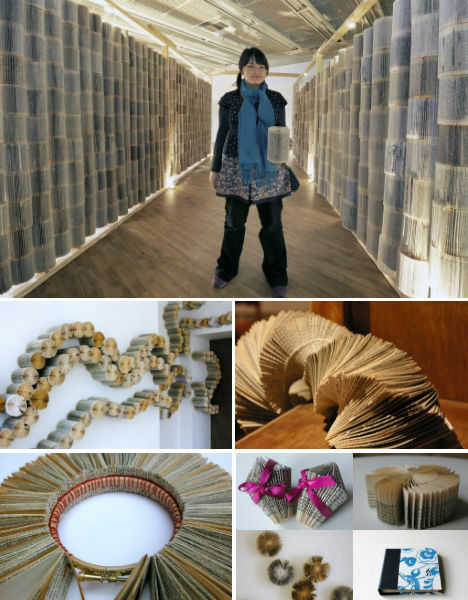 Multimedia artist Ann Hamilton has occasionally worked with books throughout her 20-year career including projects in which she connected slices of books at the spine to form shapes as well as large-scale installations of stacked books. The installations form dense towers that, by virtue of the varying thicknesses of the books, take on a painterly quality when viewed from afar. 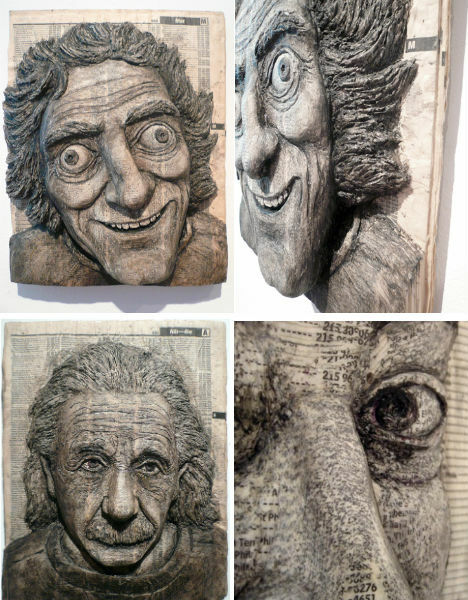 Alex Queral carves faces into books of faceless names, producing three-dimensional portraits that reach deep within discarded phone books. 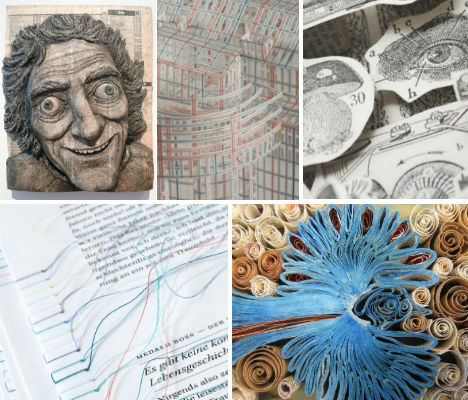 Most are famous faces like PeeWee Herman and Bob Dylan; some are realistic, while others are crafted in an abstracted style. Queral uses an X-ACTO knife and a pot of acrylic medium to carve and set the books, and then applies a black wash to bring out the features. 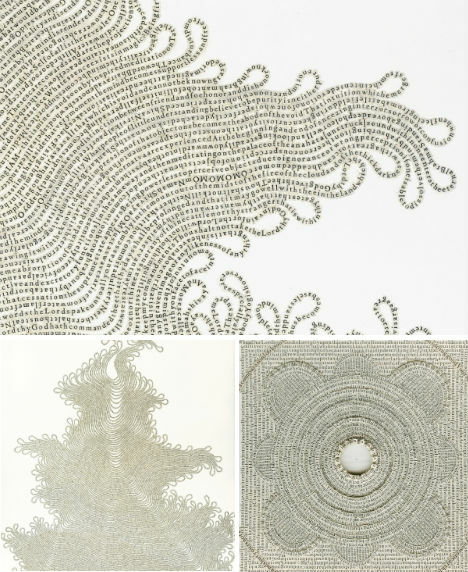 From small folded paper pieces to installations of thousands of books that fill entire rooms, the art of Yvette Hawkins is inspired by forms in architecture, grids, maps and molecules as well as the geometric forms found in nature. “The thing I love about paper is the idea that something so fragile and one dimensional can become structured and sturdy just by folding it. 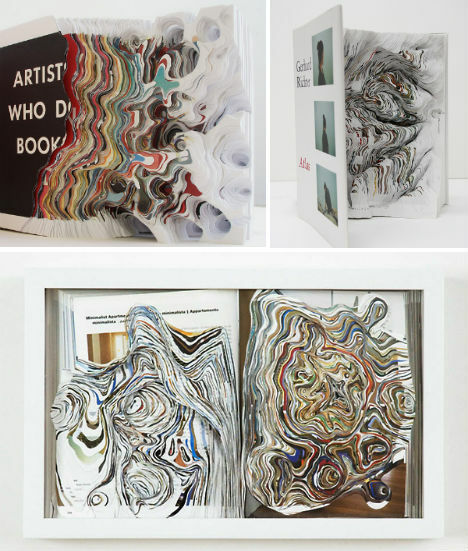 I actually started folding books because I wanted to manipulate the way printed words can be seen, so although i have always loved to work with paper, it was mark making and print that drew me to books."